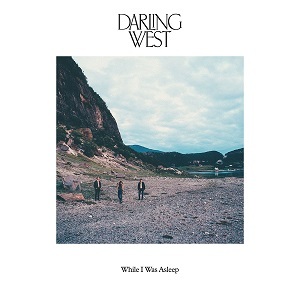 "While I was asleep" is the third album from Darline West. Their previous album, "Vinyl and a heartache" reached the Top 100 country charts in the US, and they've been played more than 3 million times on Spotify. They've played festivals such as Folk Alliance in Kansas City, Americanafest in Nashville, and SXSW in Texas. Judging by that you might assume they're an American band, but in fact they're from Norway, where they won a Norwegian Grammy for "Vinyl and a heartache" and have been played on the biggest radio stations in Norway. The band all contribute vocals and all play various instruments..
Mari does most of the lead vocals with the other two doing backing vocals. She's got a lovely voice - delicate but strong, and able to carry plenty of emotion. The album kicks off with "After my time" which definitely has a hint of "Rumours" era Fleetwood Mac. It sets the mood perfectly for the rest of the album - beautiful vocals, lovely melodies, great playing and well written songs/lyrics. Check it out here.. The lyrics are really well written and cover subjects such as anxiety, mortality and being haunted by choices that have been made. They're all thoughtful and intelligently done - no trite shallow songs here, just beautifully well written lyrics. It's a fantastic album - highly recommended.